Congratulations on launching your blog! Blogs can be time consuming but are also very rewarding. 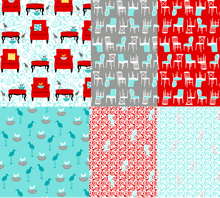 As an avid reader of quilting and crafting blogs, I love to see new fabrics, patterns and completed works by quilters. I also love to learn a little bit more about the blogger or the person behind the counter at the shop. What do you do in your spare time? A favourite nook of your house? Your first quilt etc. A favourite activity which I have been involved in is participating in swaps. I have been part of many international and national swaps (fabrics, small quilts, scrap fabrics, hand made toys etc). Unfortunately, my blog is suffering from neglect as I tend to full-time work and a toddler.